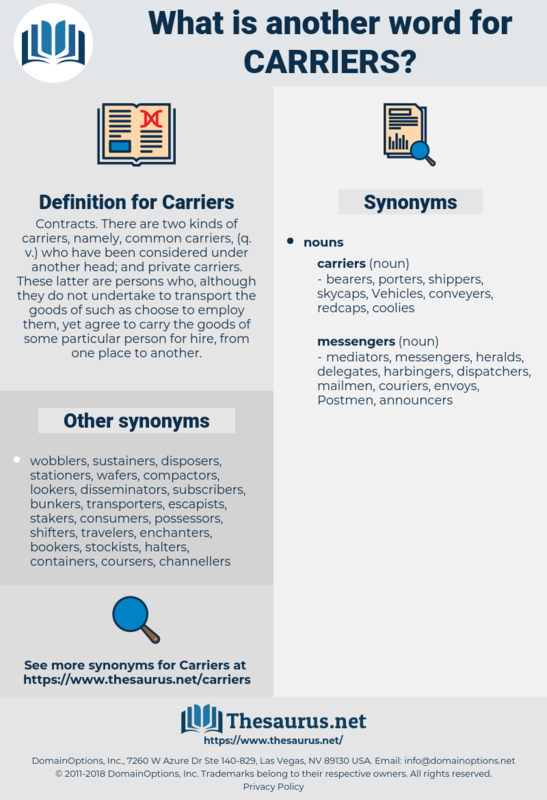 What is another word for Carriers? Contracts. 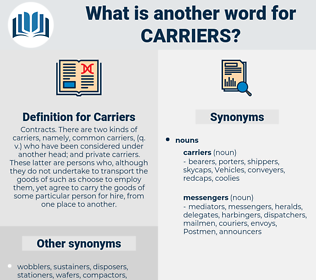 There are two kinds of carriers, namely, common carriers, ( q. v.) who have been considered under another head; and private carriers. These latter are persons who, although they do not undertake to transport the goods of such as choose to employ them, yet agree to carry the goods of some particular person for hire, from one place to another. transmitters, travellers, Vehicles, Ships, vessels, vector, vectors. manufacturers, providers, 'entreprises, players, organisations, applicants, farmers, Organizations, Societies, airways, Entities, Vendors, corporates, railways, Industries, DMCS, SMES, PARS, Operators. commercial, rail, corporates, Fer, entrepreneurs, charge, Charges, railroad, taken, railway, railways, aids, supporters, chart, iron, industry, Industries, conducted, Erf, DMCS, display, SMES, CSR, par, PARS, positions, Begun, april, posts, counts, operator, Operators. communications, aircraft, Aircrafts, cars, Helicopters, manufacturers, cardholders, airliners, freighters, careers, practitioners, Carrying, operations, airplanes, passengers, traffickers, broadcasters, fighters, transceivers, aeronautics, captains, couriers, providers, pallbearers, shareholders, factors, shipowners, launchers, packers, refiners, grievances, Instrumentalities, makers, services, mailers, procurers, recipients, givers, technicians, instances, dealers, Insurers, traders, aerial, drivers, messengers, transmission, transmissions, plane, planes, conditions, bondholders, crafts, Soldiers, exploiters, MINERS, stakeholders, publishers, riders, devices, endeavours, adapters, forwarders, competitors, Transported, 'entreprises, aviation, truckers, braces, transfer, transfers, players, professionals, airports, aeroplanes, owners, producers, conveyances, chains, Promoters, channels, developers, haulers, employers, businessmen, pieces, Boats, contractors, transporteurs, winners, attendants, harvesters, Mothers, importers, smallholders, administrations, organisations, tickets, substrates, boatmasters, means, TELECOMS, applicants, Deliveries, instruments, senders, users, paraphernalia, jets, brackets, conveyers, flying, Workplaces, Containing, bearings, licensees, farmers, underpinnings, TELCOS, Stations, warplanes, Occupations, originators, professions, holders, establishments, loggers, Mediums, compagnies, movers, headings, keepers, MEDIAS, advocates, instigators, Organizations, Infections, Ferries, tenants, fixed-wing, railroads, Societies, stanchions, warheads, processors, porters, locations, exhibitors, start-ups, hampers, shipments, troops, custodians, incumbents, Records, consignors, Patients, operatives, ship-owners, implements, loads, individuals, contributors, workers, routes, airways, entrants, endeavors, Entities, growers, runners, Factories, exporters, conveyors, proprietors, engines, bringers, racks, drawers, possessors, trucks, networks, ranges, platforms, charts, ways, Trays, guardians, conductors, Vendors, counterparts, complaints, Parents, sensors, institutions, deprived, servants, adaptors, proponents, agents, actors, Agencies, trades, products, tanks, personnel, stays, sections, items, legs, scaffolds, baskets, occupants, modes, champions, groups, others, Opportunities, Journeys, Females, burdens, reforms, Robberies, units, Ones, utilities, outlets, Copies, belts, angels, hoops, men, PATHWAYS, kits, thrusts, holdings, LANES, Boxes, sponsors, people, props, departments, Thefts, bonds, avenues, tools, rows, bellhops, VOLS, mountings, farms, Forms, cos, Bodies, wins, LINEs, corporates, entrepreneurs, railways, aids, supporters, Industries, SMES, PARS, Operators. Now there were carriers at Modelsdorf who had to convey lead from Breslau to Leipzig; when therefore his Princely Grace learnt this, he commanded that two carriers should bring this lead up to the castle, the value of which amounted to more than two hundred and fifty thalers. The nerves are the carriers of the impulses.